In the course of my cooking adventures, I’ve ended with a selection of different whisks, and I’ve been trying to understand the differences in how they each work. First of all, I have a standard metal balloon whisk purchased from Daiso, which has served me very well. I use this for beating egg whites by hand. The balloon shape is good for frothing up the whites. In addition, I also have a few other less common types of whisks. Whisk (a) comes highly recommended by Delia Smith as good for all sorts of things; it’s referred to as the ‘Wonder Whisk’. Recently, I noticed them being sold in Daiso, so no need to source for some expensive UK brand :D. I usually use it for beating a single egg, or mixing a powdered beverage as the flat shape reaches into the corners of a mug/jug better than a balloon-shaped whisk. The extra coil of wire seems to produce a lot more froth. Whisk (b) is excellent for beverages as the elongated shape can agitate the liquid throughout the depth of a mug. Easily obtained in Daiso, although I’ve seen them in Phoon Huat for even less than Daiso’s S$2 price (but with less prongs). They are handy stirrers when serving beverages as well, you can give each person one in place of providing a teaspoon. 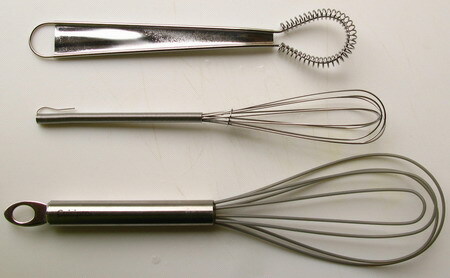 Whisk (c) is useful for sauces and batters. The flat shape enables the whisk to reach into the corners of pots and mixing bowls, while the silicone coating makes it non-scratch for your pot surfaces as well as heat-resistant. The flat shape does not produce enough froth for beating egg whites. Mine is Cuisipro brand and although I purchased it overseas some years ago, I haven’t seen the exact same item in Singapore so far. If you’re into different types of specialised whisks, including silicone ones, by Cuisipro, try visiting the Cuisipro agent in Singapore, Razorsharp (which I wrote about earlier). Where to buy takoyaki pans in Singapore? This question has come up a couple of times in the list of search engine terms that have led to my blog. I haven’t answered the question directly in any of my postings so far (except in the now-defunct ‘Q&A’ page), so I’ll put it up here now. Firstly, try the Japanese department stores – Takashimaya has the best range of Japanese cookware, also try Isetan. Daiso definitely stocks them too, and at only S$2 (no guarantees on quality though!). Another possible place to look for them is in specialist professional cookware shops like Sia Huat in Temple Street. I came across this in a cookware shop in Britain, Lakeland, which always has interesting and high-quality equipment and gadgets. It’s a plastic bottle with a pouring spout that has a coiled metal ball inside that helps to shake up the contents. Just snap shut the leak-proof spout and you can store the contents in the fridge for later, and when you’re ready to use, a quick shake will quickly blend it all together. Amazingly, nothing gets stuck in the corners, it all mixes up beautifully. * powdered beverages, especially those cereal grain drinks where the cereal bit tends to settle at the bottom. * waffle, pancake and poh piah skin batter — stores well in fridge so you can have pancakes & skins ready in seconds! If you’re looking for them in Singapore, I happened to chance upon them in GNC, in the bodybuilding supplements section as they’re used for making protein shakes. The ones in GNC are 28 oz (830ml) capacity, bigger than the one in my photo, which is 20 oz (590ml), and sold for about S$20. The official Blender Bottle website has full specs and details of the type of plastic & stainless steel used as well as photos and testimonials. When I first started finding out about different types of coconut graters, it was with the intention of finding the best way of preparing coconut shreds to make coconut milk. As you can read here, the method used in my family is to use a traditional aluminium grater. As you’ll notice, it’s a pretty scary looking piece of equipment and could be very dangerous if your hands slip or when the piece of coconut gets very small! So I decided to try out the safer suction-style grater used in South Asia, which grates the coconut flesh from inside the shell. However, the problem with both kinds of graters, especially the suction one, is that they don’t produce shreds of coconut that are fine enough. When making coconut milk, the finer the shreds, the greater the volume of milk you’ll be able to extract. By this time I’d also developed a fascination with different types of graters: in the material and shape of the cutting surface as well as the shape of the grated items. So I splashed out on one of those Microplane box graters, which grates two sizes and comes with a knuckle protecting slider attachment which actually works! (I’ve bought graters in the past which had rather useless finger protector gadgets). The selling point of Microplane tools is that they are very sharp and started out as woodworking tools. With the sharp blades and the knuckle protector, we can grate coconut more quickly than with our traditional spiked aluminium grater and it’s nicer using this high-quality tool than the S$6 suction crank grater which also rusts easily. So great new grater but back to square one with the original problem of trying to produce super-fine coconut shreds. This coconut will now produce a good yield of coconut milk, following the extraction method I explained here. One thing that fascinated me was the various styles of traditional coconut graters used in different cultures, and on a recent trip to the National Museum of Singapore, I was pleasantly surprised to find a display of traditional coconut graters. You can see here a couple of stool-type graters in the foreground and at the back, handheld versions, one of which looks rather phallic! Partially obscured on the right-hand side towards the back is a suction-style grater similar to the one I described in my previous posting. This display is found inside the Food gallery, which is one of the four “Living Galleries” and is free entry from 6-8pm daily :). A bumper posting for those of you in Singapore :). Razor Sharp, which I mentioned in my posting on ceramic vegetable peelers, is selling a handful (only a handful, literally) of Kyocera and Cuisipro items at great discounts. I also picked up a Cuisipro silicone spoon, with detachable metal handle for half price at S$12. Earlier, I posted about my favourite silicone kitchen tool, the brush. I’ve been wanting a mixing spoon that isn’t too floppy, so that it can deal with heavy batters and doughs, and silicone being heat-resistant, this can also be used for cooking on the stove. Plus it’s non-abrasive and can be used with non-stick cookware, and scrapes really clean. The removable head is an added plus which allows for thorough cleaning. Some weeks ago, I discovered that Brown Rice Paradise at Tanglin Mall has changed hands, moved to a ground floor location and gotten a spiffy new supermarket-look. The prices were already rather stiff before, I hope this new jazzed-up shop doesn’t jack them up even more! The shop is currently closed and will open again on 5th April. They have a brand new website which is offering some promotions right now. – REFER A FRIEND by forwarding their details below to us, or better still, swing by our store with your friend(s), and each receive a free BRP-gift! You probably already know Green & Blacks organic chocolates. These are widely available in supermarket organic sections, health food stores etc. Priced at just under S$7, they are a typical price for organic chocolates, with some brands costing even more. That is, if you haven’t already discovered Carrefour organic chocolate (milk –S$2.65, 74% dark — S$3.95 and cooking S$3.25) , as well as Marks & Spencer organic Swiss chocolate at S$4+, which I think tastes nicer than the Carrefour ones. 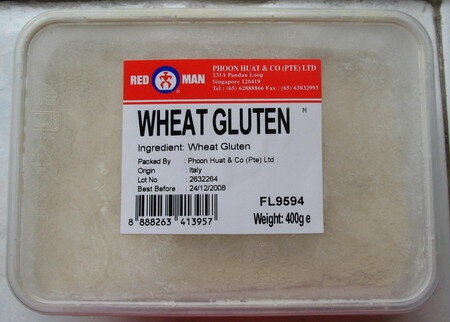 Thanks to the tip from Canton Pixie, I finally found vital wheat gluten for baking bread at Phoon Huat. I missed it before because it’s kept inside the refrigerator, not next to the flours. Incidentally, vital wheat gluten should be stored it in the fridge, where it can be kept for six months (1 year if frozen). Please click on image for larger version. In contrast, vital wheat gluten from Bob’s Red Mill, which is imported from USA and sold in upmarket shops like Vivocity’s Naturally Marketplace, is stacked on the shelf of flours and grains next to all the other Bob’s Red Mill items. There is also a massive price difference: about S$4.70 for 400g in Phoon Huat, and about S$26 for about 600g+ of the Bob’s Red Mill version in Naturally Marketplace! I’m sticking my neck out here but I’m going to venture that this will be the highlight of my kitchen tool discoveries for 2008. Ceramic knives were something totally new to me and did not attract my attention despite walking past the shelf full of them at Tangs many times. It took a trip out to the obscure Tan Boon Liat Building in Outram, where Nature’s Glory is located, where I happened to step into a shop on the ground floor selling kitchen equipment. I later discovered that the very knowledgeable and friendly man in the shop who introduced me to Kyocera ceramic cutlery tools, is food blogger, Chubby Hubby’s ‘knife sensei’, David, at Razor Sharp – a knife sharpening service and shop that is also the agent for various lines of premium kitchen equipment, including Kyocera. Finally, motivated by our dreadful old vegetable peeler that’s worn-out, rusty with blades that are twisted out of shape and almost impossible to use. I decided to invest in a Kyocera vegetable peeler with blades made of ceramic which won’t rust or get bent. Fruits like apples and pears also won’t brown so easily because they haven’t been peeled with a metal blade that promotes oxidation. I used it to peel daikon today for a steamed Chinese radish cake 蘿蔔糕 and it was a jaw-dropping experience! Razor-sharp and utterly smooth, it also sliced terrifically fine so just the peel comes off with no wastage. Of course it’s an expensive tool, but just the thing if you need an antidote to one-too-many Daiso $2 disasters :D. Tangs offers 25% off selected Kyocera products, including the vegetable peeler (full price, S$35), or next time you pop down to Nature’s Glory, you could go straight to the agent, Razor Sharp (unfortunately, all items are typically full list price except for occasional sale – right now, it’s the veg peeler with U-shaped handle on sale at a fabulous S$12! also the ceramic julienne slicer for S$19, usual price S$52) . As for ceramic knives, although they can be great to use, they are more brittle than steel knives, hence the mixed reviews here and here, and if you go for the hard (haha!) details of knife construction, do check out this review. If you’re still keen to try out a ceramic knife as well as the peeler, rush down to the current Isetan sale where a medium-sized kitchen knife is paired with the vegetable peeler for S$69, a fraction of the regular price (plus 20% discount for Isetan members, I think).